Fish and Cruise may indicate different things for different people. This “Family Value” series from G3 might satisfy everyone’s idea of what that means, and all for less than $20,000 as equipped for this review. For the person in the family (most likely, but not limited to dad) who wants to fish, it is a great, easy to get around on fishing platform. When dad is trying to invest the family savings on a fishing boat, the rest of the family may not see the fairness in that decision. When the family gets to see the cruising possibilities on this great cruising platform, everyone wins. Dad may also get to show the rest of the family that fishing can be fun for them too. An “L” shaped lounge is placed aft, with loads of storage capacity under. An ABS table lives in the centre of this area for lunch or snacks. Just behind the lounge is a large sun pad for the sun worshipers to stretch out. 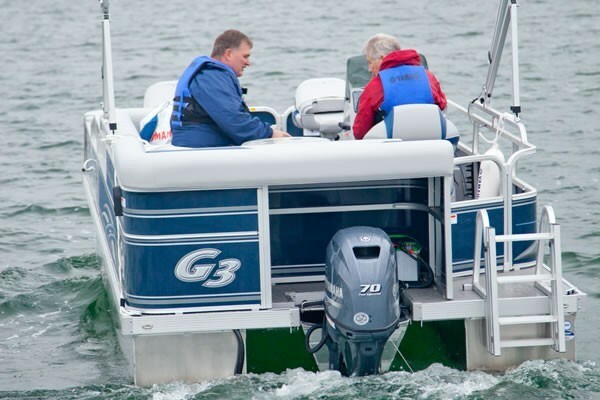 Through the aft door starboard, is access to the 4-step boarding ladder, providing easy access back on board from the water. The standard booted bimini stores out of the way above this area. All four, entry doors have lift/lock mechanisms with guards to prevent pinched fingers. Two forward-folding fishing seats are placed at the bow. All of this is mounted on marine-grade plywood covered with easy to clean after fishing or cruising, marine-grade vinyl flooring. Snap-in carpet is available in two halves, front and rear sections, to luxury it up a notch. Floor level courtesy lights keep this all safe for night cruising or while at anchor. The comfortable helm seat is fully adjustable and the helm has the usual instrumentation including speedo, tach, trim and fuel gauges as well as a Sony AM/FM CD stereo with one-touch retractable cover. 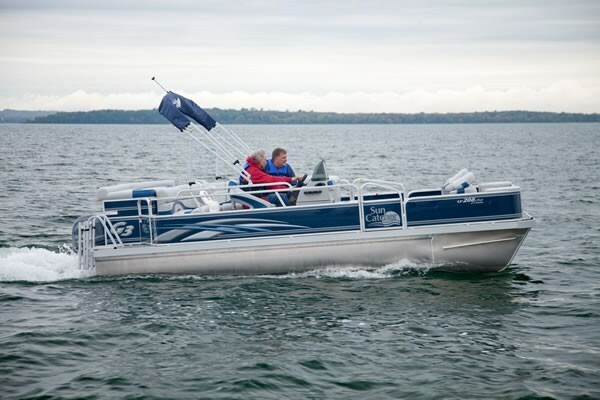 Yamaha deluxe binnacle controls, tinted Plexiglas windshield, marine horn and 12-volt accessory outlet complete the helm. One more seat built into the front of the helm station covers the live well with aerator pump. Four upright rod holders are placed beside the helm. Acceleration is what one would expect for a 20 footer on pontoons. It planes with little effort and 5000 RPM’s yields mid 20’s MPH. 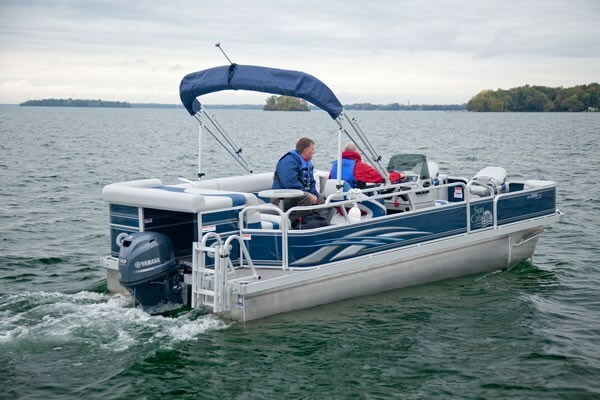 If you wanted to water ski a lot, and a ski tow bar is an option, you might want to upgrade to the maximum rated 90 HP. In the days of ethanol fuel additives, a standard water/fuel separator is a valuable addition to the engine package. 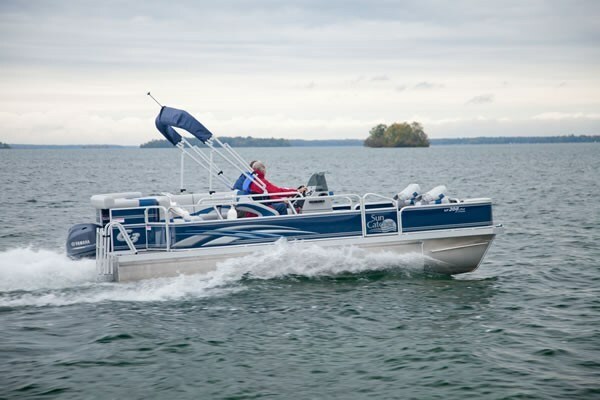 Popular options to customize your cruise/fish/ski package to your liking include such items as tandem trailer, ski tow bar, slider refreshment centre with pop-up pillows, a floating ottoman/cooler with cup holders, arm enclosure pop-up change room, and four different Garmin options. Use it as it comes or customize it for your family’s use, but there’s something for everyone in the family to enjoy.